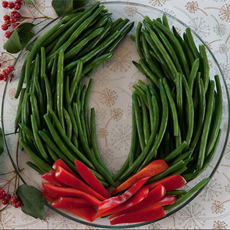 Deck the halls with…green beans! Crudités, with raw or blanched fresh green beans and a bowl of dip in the center. Salad, raw or blanched, tossed in vinaigrette. Steamed, and tossed with salted butter and fresh herbs (basil, dill, parsley). Choose the smaller beans: They’ll be sweeter and more tender. Long, thicker beans have been left on the vine too long, and can be tough and tasteless. Fresh green beans should be tender enough to eat raw, and should have a crisp snap when you break them apart. If they’re rubbery and bend, pass them by. Depending on the other sides, plan for 4-8 servings per pound of beans. Optional: anchovies, halved in a mustard vinaigrette, garnished with quartered hard-boiled eggs. Green bean and bell peppers crudités wreath from Between The Bread | NYC. Re-arrange this green bean salad into a salad wreath (photo courtesy Keys To The Cucina). 1. MAKE the vinaigrette. 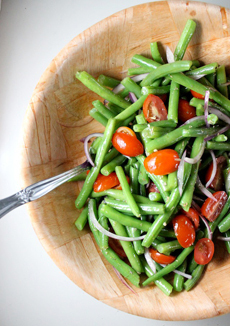 Toss the green beans and onion with the vinaigrette and refrigerate in a covered bowl to let the flavors meld. 3. DRAIN and mound the beans onto a serving plate in the shape of a wreath. Decorate the wreath with the tomatoes and anchovies and sprinkle with the herbs. Arrange the “bow” at the top or bottom.